Blazegraph(tm) is a scale-out storage and computing fabric supporting optional transactions, very high concurrency, and very high aggregate IO rates. While graph databases are a perfect fit for storing and querying structured data, they are not primarily designed to deal efficiently with unstructured data and keyword queries. Therefore, such unstructured data is often kept in dedicated systems that are laid out to tackle the specific challenges for evaluating keyword queries in an efficient way — including advanced techniques such as stemming, TF-IDF indexing, support for complex keyword search requests, scoring, etc. Graph databases, on the other hand, are about connecting things, so in many scenarios we want to combine the capabilities of structured queries with those of queries against a fulltext index. To give just one simple example, assume we have a structured graph database with data about historical characters and a complementary keyword index over a corpus of historical texts (which may or may not be under our control). Assume we now want to combine structured queries — asking, e.g., for persons that fall into certain categories such as epochs or countries they lived in — with historical texts from the index that prominently feature these persons. The upcoming Blazegraph 1.5.2 release will support such hybrid queries against external Solr fulltext search indices. The fulltext search feature has been implemented as a Blazegraph custom service: using a standard-compliant SPARQL SERVICE call with a reserved service URI, you can now easily combine structured search capabilities over the graph database with information held in an external Solr index. Blazegraph’s hybrid search capabilities are currently used by the British Museum in the ResearchSpace project, which aims at building a collaborative environment for humanities and cultural heritage research using knowledge representation and Semantic Web technologies. In this context, Blazegraph’s hybrid search feature supports users in expressing complex search requests for cultural heritage objects. Hybrid SPARQL queries utilizing a Solr index are used to support a semantic autocompletion: As the user types a keyword, hybrid queries are issued in real-time to match keywords against entities in a cultural heritage knowledge graph. Depending on the current context of the search, persons, objects or places are suggested, providing a user friendly means to disambiguate terms as the user types. If you’re going to be in San Jose for the Smart Data conference, we’re giving a tutorial on the approach. return the identified person URIs (variable ?person, from the graph database), the ID of the keyword index document (variable ?kwDoc, from the fulltext index), and the associated text snippet provided by the keyword index (variable ?snippet). As the example illustrates, parameterization of the keyword index is made via a reserved, “magic vocabulary”: for instance, within the SERVICE keyword, the object linked through fts:search identifies the search string to be submitted against the keyword index, while fts:endpoint points refers to the address of the Solr server. in order to search for keyword index documents mentioning these persons without explicitly mentioning “expressionism” (the “-” in Solr is used to express negation). If you want to learn more about Blazegraph’s upcoming Solr index support, please check out the documentation in our Wiki. Do you have a cool new application using Blazegraph or are interested in understanding how to make Blazegraph work best for your application? Get in touch or send us an email at blazegraph at blazegraph.com. This entry was posted in Blazegraph, Blazegraph Release and tagged Fulltext Search, Keyword Index, Solr on July 14, 2015 by Michael Schmidt. We’re in the final stages of the Blazegraph 1.5.2 release. This is major release for Blazegraph and brings both exciting new features as well as important performance and query optimizations. You can see the full set of tickets for the release here (it’s our first one since we’ve migrated to JIRA). External SOLR Search Integration: Use the SPARQL Service keyword to search content externally stored in SOLR. Substantial refactoring of the Query Plan Generator in close collaboration with our partner, Metaphacts. This both fixes a number of bugs in the query optimizer and improves performance. Fixes and improvements for embedded and remote clients including Blueprints and Rexster. Online Backup for the non-HA Blazegraph Server. Did you see Blazegraph featured in the Bloor Group Briefing room? Blazegraph was recently featured in the Bloor Group Briefing room. Check out the video presentation below, if you missed it. This entry was posted in Blazegraph, Blazegraph Release, Video and tagged Blazegraph, Video on July 12, 2015 by Brad Bebee. All, we have finally completed the migration from trac to jira. Please visit and use the new jira instance for Blazegraph. Many thanks to Brad for making this happen! Note: trac will remain online in a read-only mode. A cross-walk of trac to jira tickets is available. All trac tickets have been updated with a comment containing the link to the corresponding JIRA ticket. This entry was posted in Uncategorized on May 13, 2015 by Bryan Thompson. What pairs well with Veuve Clicquot and Big Data for Graphs? 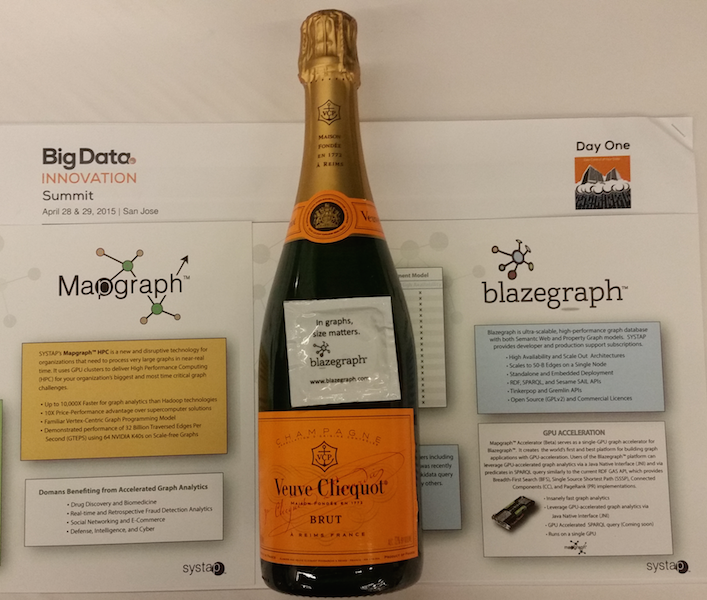 Have you ever wondered what to pair with Veuve Clicquot and your Big Data graph challenge? The 2015 Big Data Innovations Summit has the answer: Blazegraph and Mapgraph. We won the Big Data Startup Award at the 2015 Big Data Innovations Summit in San Jose. 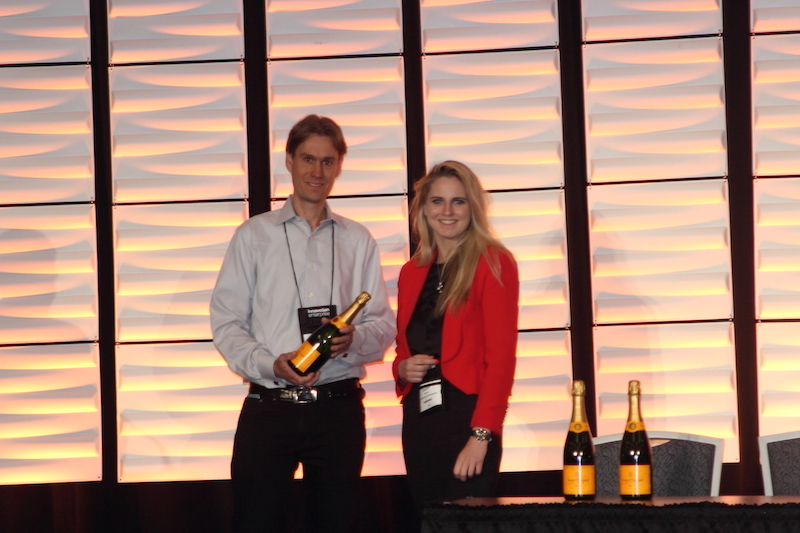 SYSTAP wins Big Data Startup award at the 2015 Big Data Innovations conference. Our solutions for scalable graph technologies were recognized with the award. Naturally, the champagne pairs perfectly with our Blazegraph database platform and Mapgraph technology for GPU-accelerated graph analytics. Don’t forget our Blazegraph SWAG (must be present to appreciate…) because In graphs, size matters. Blazegraph™ is our ultra high-performance graph database supporting Blueprints and RDF/SPARQL APIs. It supports up to 50 Billion edges on a single machine and has a High Availability and Scale-out architecture. It is in production use for Fortune 500 customers such as EMC, Autodesk, and many others. The Wikimedia Foundation recently chose Blazegraph to power the Wikidata Query Service. Mapgraph™ is our disruptive new technology to use GPUs to accelerate data-parallel graph analytics up to 10,000X faster than other approaches. It can traverse billions of edges in milliseconds. Whether you need an embedded graph database, a 1 Trillion Edge Graph Database, or the ability to traverse billions of edges in milliseconds, SYSTAP’s award-winning graph solutions can meet your needs. We’d love to hear about your success with our technology or talk to you about how we can help scale your graph challenge. Via Twitter: @Blazegraph or via email. This entry was posted in Blazegraph, Mapgraph on April 29, 2015 by Brad Bebee. Bryan and I were chatting back on the train from NYC on CPU memory bandwidth. Here’s a quick write-up of the discussion. 15 years ago database researchers recognized that CPU memory bandwidth was the limiting factor for relational database performance. This observation was made in the context of relatively wide tables in RDBMS platforms that were heavily oriented to key range scan on a primary key. The resulting architectures are similar to the structure of array (SOA) pattern used by the high performance computing community and within our Mapgraph platform. Graphs are commonly modeled as 3-column tables. These tables intrinsically have a very narrow stride, similar to column stores for relational data. Whether organized for main memory or disk, the goal of the query planner is to generate an execution strategy that is the most efficient for a given query. Graph stores that are organized for disk maintain multiple indices with a log structured cost (e.g., a B+Tree) that allow them to jump to the page on the disk that has the relevant tuples for any given access path. Due to the relative cost of memory and disk, main memory systems (such as SPARQLcity) sometimes choose a single index and resort to full table scans when the default index is not useful for a query or access pattern. In making such decisions, main memory databases are trading off memory for selectivity. These designs can consume fewer resources, but it can be much more efficient to have a better index for a complex query plan. Thus, a disk based database can often do as well as or better than a memory based database of the disk based system has a more appropriate index or family of indices. In fact, 90%+ of the performance of a database platform comes from the query optimizer. The difference in performance between a good query plan and a bad query plan for the same database and hardware can be easily 10x, 100x, or 10000x depending on the query. A main memory system with a bad query plan can easily be beaten by a disk -based system with a good query plan. This is why we like to work closely with our customers. For example, one of our long term customers recently upgraded from 1.2.x (under a long term support contract) to 1.5.x and obtained a 100% performance improvement without changing a single line of their code. Main memory systems become critical when queries much touch a substantial portion of the data. This is true for most graph algorithms that are not hop constrained. For example, an unconstrained breadth first search on a scale free graph will tend to visit all vertices in the graph during the traversal. A page rank or connected components computation will tend to visit all vertices on each iteration and may required up to 50 iterations to converge page rank to a satisfactory epsilon. In such cases, CPU memory architectures will spend most of the wall clock time blocked on memory fetches due to the inherent non-local access patterns during graph traversal. Architectures such as the XMT/XMT-2 (the Urika appliance) handle this problem by using very slow cores, zero latency thread switching, a fast interconnect and hash partitioned memory allocations. The bet of the XMT architecture is that non-locality dominates so you might as well spread all data out everywhere and hide the latency by having a large number of memory transactions in flight. We take a different approach with GPUs and achieve a 10x price/performance benefit over the XMT-2 and a 3x cost savings. This savings will increase substantially when the Pascal GPU is released in Q1 2016 due to an additional 4x gain in memory bandwidth driven by the breadth of the commodity market for GPUs. We obtain this dramatic price/performance and actual performance advantage using zero overhead context switching, fast memory, 1000s of threads to get a large number of in flight memory transactions, and paying attention to locality. The XMT-2 is a beautiful architecture, but locality *always* matters at every level of the memory hierarchy. This entry was posted in Uncategorized on April 3, 2015 by Brad Bebee. Blazegraph 1.5.1 is released! This is a major release of Blazegraph™. The official release is made into the Sourceforge Git repository. Releases after 1.4.0 will no longer be made into SVN. The full feature matrix is here. You can download the WAR (standalone), JAR (executable), or HA artifacts from sourceforge. – RDF Graph Mining Service (GASService) . – Reification Done Right (RDR) support . Note: Versions with (*) MAY require data migration. For details, see . – This release includes significant performance gains for property paths. – Both correctness and performance gains for complex join group and optional patterns. – Support for concurrent writers and group commit. This is a beta feature in 1.5.1 and must be explicitly enabled for the database. Group commit for HA is also working in master, but was not ready for the 1.5.1 QA and hence is not in the 1.5.1 release branch. Full release notes are here. This entry was posted in Uncategorized on March 20, 2015 by Brad Bebee. Blazegraph™ has been selected by the Wikimedia Foundation to be the graph database platform for the Wikidata Query Service. Read the Wikidata announcement here. Blazegraph™ was chosen over Titan, Neo4j, Graph-X, and others by Wikimedia in their evaluation. There’s a spreadsheet link in the selection message, which has quite an interesting comparison of graph database platforms. Wikidata acts as central storage for the structured data of its Wikimedia sister projects including Wikipedia, Wikivoyage, Wikisource, and others. The Wikidata Query Service is a new capability being developed to allow users to be able to query and curate the knowledge base contained in Wikidata. We’re super-psyched to be working with Wikidata and think it will be a great thing for Wikidata and Blazegraph™. This entry was posted in Blazegraph on March 7, 2015 by Brad Bebee. We’re going to be formally launching our GPU-based graph analytics acceleration products, Mapgraph™ Accelerator and Mapgraph™ HPC, at the NVIDIA GTC conference in San Jose the week of 16 March. We will also be competing as one of 12 finalists for NVIDIA’s early stage competition for a $100,000 prize. If you’re in the area, come to GTC on Wednesday, March 18 and vote for us! Mapgraph™ Accelerator (Beta) serves as a single-GPU graph accelerator for Blazegraph™. We believe it will provide the world’s first and best platform for building graph applications with GPU-acceleration. It will bridge the gap between our Blazegraph™ database platform and the GPU acceleration for graph analytics. Users of the Blazegraph™ platform will be able to leverage GPU-accelerated graph analytics via a Java Native Interface (JNI) and via predicates in SPARQL query similarly to our current RDF GAS API, which provides Breadth-First Search (BFS), Single Source Shortest Path (SSSP), Connected Components (CC), and PageRank (PR) implementations. Mapgraph™ HPC is a new and disruptive technology for organizations that need to process very large graphs in near-real time. It uses GPU clusters to deliver High Performance Computing (HPC) for your organization’s biggest and most time critical graph challenges. We are currently enrolling Beta customers for Mapgraph™ Accelerator and Mapgraph™ HPC. Chesapeake Technologies International has already accelerated a military planning application seeing computation times drop from minutes for a single-solution to seconds for the generation of multiple scenarios. We’re doing a session on it at GTC. Contact us if you’re interested finding out more. This entry was posted in Blazegraph, Mapgraph on March 6, 2015 by Brad Bebee. Starting with 1.5.1, BlazeGraph supports task-oriented concurrent writers. This support is based on the pre-existing support for task-based concurrency control in BlazeGraph. Those mechanisms were previously used only in the scale-out architecture. They are now incorporated into the REST API and can even be used by aware embedded applications. This is a beta feature — make backups! There are two primary benefits from group commit. First, you can have multiple tenants in the same database instance and the updates for one tenant will no longer block the updates for the other tenants. Thus, one tenant can be safely running a long running update and other tenants can still enjoy low latency updates. Second, group commit automatically combines a sequence of updates on one (or more) tenant(s) into a single commit point on the disk. This provides higher potential throughput. It also means that it is no longer as important for applications to batch their updates since group commit will automatically perform some batching. Early adopters are encouraged to enable this using the following symbolic property. While the Journal has always supported group commit at the AbstractTask layer, we have added support for hierarchical locking and modified the REST API to use group commit when this feature is enabled. Therefore this feature is a “beta” in 1.5.1 while work out any new kinks. # Note: Default is false. If you are using the REST API, then that is all you need to do. Group commit will be automatically enabled. This can even be done with an existing Journal since there are no differences in the manner in which the data are stored on the disk. If you are using the internal APIs (Sail, AbstractTripleStore, stored queries, etc.) then you need to understand what is happening when group commit is enabled and make a slight change to your code. When you set this property to true, you are asserting that your application will submit all tasks for evaluation to the IConcurrencyManager associated with the Journal and you are agreeing to let the database decide when it will perform a commit. When you set this property to false (the default), you are asserting that your application will control when the database performs a commit. This is how embedded application has been written historically. Any mutation operations must use the following incantation. This incantation will submit a task that obtains the necessary locks and the task will then run. If the task exits normally (versus by throwing an exception) then it will join the next commit group. The Future.get() call will return either when the task fails or when its write set has been melded into a commit point. There are a few “gotchas” with the group commit support. This is because commits are decided by IApiTask completion and tasks are scheduled by the concurrency manager, lock manager, and write executor service. Mutation tasks that do not complete normally MUST throw an exception! Applications MUST NOT call Journal.commit(). Instead, they submit an IApiTask using AbstractApiTask.submit(). The database will meld the write set of the task into a group commit sometime after the task completes successfully. BigdataSailConnection.commit() no longer causes the database to go through a commit point. You MUST still call conn.commit(). It will still flush out the assertion buffers (for asserted and retracted statements) to the indices, which is necessary for your writes to become visible. When you task ends and the indices go through a checkpoint, it does not actually trigger a commit. Thus, in order to use group commit, you must obtain your connection from within an IApiTask, invoke conn.commit() if things are successful and otherwise throw an exception. The following template shows what this looks like. // Example of a concurrent writer task using group commit APIs. conn.commit(); // Commit the mutation. The group commit mechanisms are based on hierarchical locking and pre-declared locks. Tasks pre-declare their locks. The lock manager orders the lock requests to avoid deadlocks. Once a task owns its locks, it is executed by the WriteExecutorService. Lock in AbstractTask is responsible for isolating its index views, checkpointing the modified indices after the task has finished its work, and handshaking with the WriteExecutorService around group commits. Most tasks just need to declare the namespace on which they want to operate. This will automatically obtain a lock for all indices in that namespace. Some special kinds of tasks (those that create and destroy namespaces) must also obtain a lock on the global row store (aka the GRS). This is an internal key-value store where BlazeGraph stores the namespace declarations. This entry was posted in Uncategorized on February 27, 2015 by Bryan Thompson. Starting with the 1.5.0 release, SYSTAP’s graph database platform will be called Blazegraph™. It is built on the same platform and maintains 100% binary and API compatibility with Bigdata®. SYSTAP will be fully integrating the Blazegraph™ brand over the course of 2015 and all of the existing wiki, blog, and other related pages will be updated. This is a major release of Blazegraph™. This is the initial release made into the Sourceforge Git repository. Releases after 1.4.0 will no longer be made into SVN. .
Blazegraph™ is specifically designed to support big graphs offering both Semantic Web (RDF/SPARQL) and Graph Database (tinkerpop, blueprints, vertex-centric) APIs. It features robust, scalable, fault-tolerant, enterprise-class storage and query and high-availability with online backup, failover and self-healing. It is in production use with enterprises such as Autodesk, EMC, Yahoo7!, and many others. Blazegraph™ provides both embedded and standalone modes of operation. Blazegraph™ is a horizontally-scaled, open-source architecture for indexed data with an emphasis on RDF capable of loading 1B triples in under one hour on a 15 node cluster. It operates in both a single machine mode (Journal), highly available replication cluster mode (HAJournalServer), and a horizontally sharded cluster mode (Federation). The Journal provides fast scalable ACID indexed storage for very large data sets, up to 50 billion triples / quads. The HAJournalServer adds replication, online backup, horizontal scaling of query, and high availability. The federation provides fast scalable shard-wise parallel indexed storage using dynamic sharding and shard-wise ACID updates and incremental cluster size growth. Both platforms support fully concurrent readers with snapshot isolation. Distributed processing offers greater throughput but does not reduce query or update latency. Choose the Journal when the anticipated scale and throughput requirements permit. Choose the HAJournalServer for high availability and linear scaling in query throughput. Choose the BigdataFederation when the administrative and machine overhead associated with operating a cluster is an acceptable tradeoff to have essentially unlimited data scaling and throughput. See [1,2,8] for instructions on installing bigdata(R),  for the javadoc, and [3,5,6] for news, questions, and the latest developments. For more information about SYSTAP, LLC and bigdata, see . Starting with the 1.0.0 release, we offer a WAR artifact  for easy installation of the single machine RDF database. For custom development and cluster installations we recommend checking out the code from SVN using the tag for this release. The code will build automatically under eclipse. You can also build the code using the ant script. The cluster installer requires the use of the ant script. Starting with the 1.3.0 release, we offer a tarball artifact  for easy installation of the HA replication cluster. Starting with the 1.5.0 release, we offer an executable jar file  for getting started quickly with minimal setup. http://trac.bigdata.com/ticket/868 COUNT(DISTINCT) returns no rows rather than ZERO. – http://trac.bigdata.com/ticket/196 (Journal leaks memory). – http://trac.bigdata.com/ticket/570 (MemoryManager Journal does not implement all methods). – http://trac.bigdata.com/ticket/232 (Bottom-up evaluation semantics). – http://trac.bigdata.com/ticket/107 (Unicode clean schema names in the sparse row store). – http://trac.bigdata.com/ticket/124 (TermIdEncoder should use more bits for scale-out). – http://trac.bigdata.com/ticket/225 (OSX requires specialized performance counter collection classes). – http://trac.bigdata.com/ticket/348 (BigdataValueFactory.asValue() must return new instance when DummyIV is used). – http://trac.bigdata.com/ticket/349 (TermIdEncoder limits Journal to 2B distinct RDF Values per triple/quad store instance). – http://trac.bigdata.com/ticket/351 (SPO not Serializable exception in SIDS mode (scale-out)). – http://trac.bigdata.com/ticket/352 (ClassCastException when querying with binding-values that are not known to the database). – http://trac.bigdata.com/ticket/353 (UnsupportedOperatorException for some SPARQL queries). – http://trac.bigdata.com/ticket/355 (Query failure when comparing with non materialized value). Blazegraph™ is a horizontally-scaled, general purpose storage and computing fabric for ordered data (B+Trees), designed to operate on either a single server or a cluster of commodity hardware. Blazegraph™ uses dynamically partitioned key-range shards in order to remove any realistic scaling limits – in principle, Blazegraph™ may be deployed on 10s, 100s, or even thousands of machines and new capacity may be added incrementally without requiring the full reload of all data. The Blazegraph™ RDF database supports RDFS and OWL Lite reasoning, high-level query (SPARQL), and datum level provenance. This entry was posted in Uncategorized on February 12, 2015 by Brad Bebee.